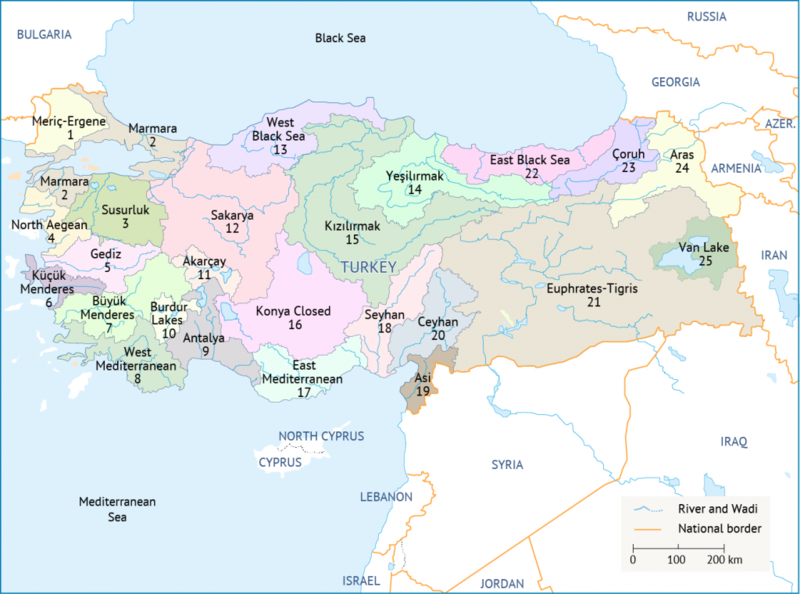 Turkey is divided into 25 basins that correspond with its hydrological features. Most rivers originate in Turkey and there are more than 120 natural lakes, 293 dams and 1,000 small dam resorvoirs.Annual average flow in the basins is 186BCM. Possessing 28.4% of Turkey’s water potential, the Euphrates-Tigris River Basin is the largest basin in terms of both surface area and water potential. As mentioned above, Turkey’s total usable water potential is 112BCM, of which 98BCM is surface water and 14BCM is groundwater. Approximately 20-25% of Turkey’s irrigable area is irrigated with groundwater. The share of groundwater use in industry is 48%. Groundwater resources are legislated by the Groundwater Law of 1962. In accordance with this law, groundwater resources fall under the jurisdiction of the state. The protection, research, registration and use of these waters are also covered by this law. Every well has to be registered, but unlicensed well digging is hard to control. As in other places around the world, groundwater resources in Turkey are used for irrigation to a great extent. In order to monitor groundwater extractions and prevent overuse, a groundwater measuring regulation was enacted in 2011. Effective implementation of this regulation faces several challenges such as the existence of unlicensed wells, the difficulty of preventing illegal use of wells and changing climate and precipitation patterns. Despite these challenges, the regulation is a major step forwards in the protection and management of groundwater resources. Cengiz Sagnak, Ülkemizin Yeraltısuyu Potansiyeli, Kullanımı ve Sınıraşan Akiferler, 17 April 2013, Orman ve Su İşleri Bakanlığı, Hizmet İçi Eğitim, Akçakoca, Bolu. Cengiz Sagnak, Ulkemizin Yeraltısuyu Potansiyeli, Kullanımı ve Sınıraşan Akiferler, 17 April 2013, Orman ve Su İşleri Bakanlığı, Hizmet İçi EGitim, Akçakoca, Bolu.